The following article was featured in the February 4th, 2003 Chicago Sun-times Newspaper. Is it any wonder that the largest Satanic religion in the world endorses witchcraft? Not at all. Satan is hard at work friend, never needing a rest; never taking a vacation. The fact that the Roman Catholic Religion endorses witchcraft should settle any previous doubts in your mind as to the legitimacy of the Catholic Church. The Catholic religion is a fraud, an imposter, damning the untold souls of billions to a Godless eternity in the depths of the lake of fire. 1Sa:15:23: For rebellion is as the sin of witchcraft, and stubbornness is as iniquity and idolatry..."
2Ch:33:6: And he caused his children to pass through the fire in the valley of the son of Hinnom: also he observed times, and used enchantments, and used witchcraft, and dealt with a familiar spirit, and with wizards: he wrought much evil in the sight of the LORD, to provoke him to anger. Na:3:4: Because of the multitude of the whoredoms of the wellfavoured harlot, the mistress of witchcrafts, that selleth nations through her whoredoms, and families through her witchcrafts. God is the ONLY source of power in this universe. The devil, as well as all human government, receive their power from God alone. Nothing can happen in this universe without God's permission. We are commanded in the Scriptures to submit to the highest power--God. The Bible (King James 1611) is God's Word and presents to us a clear image of Who God is--God the Father, God the Son and God the Holy Spirit; One God, Who has revealed Himself to mankind in the form of a Godhead. This is what the Bible teaches. Sadly, children are NOT being taught about the power of God. Children are being taught through Harry Potter about the power of witchcraft, sorcery and spells...literal Satanic practices. It's not just clean fun. The names of real devils are mentioned in the Harry Potter books. Satanism is glorified, Christ is diminished. 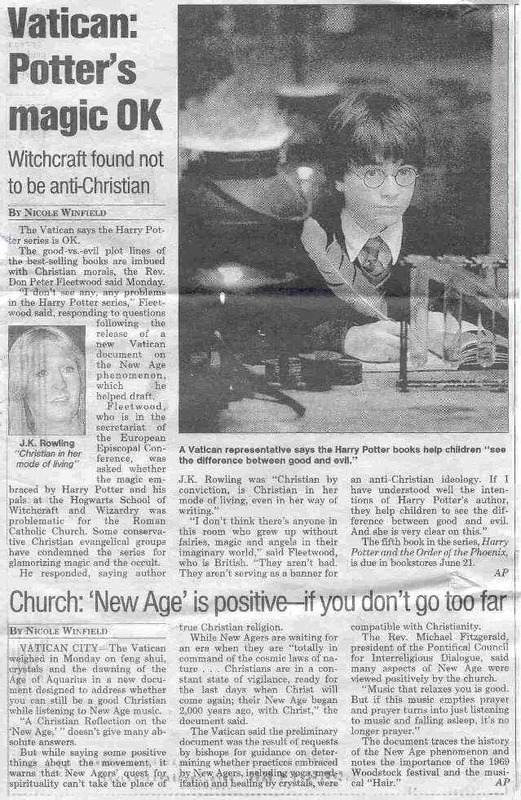 Just as the Catholic religion has diminished Jesus Christ to nothing by replacing Him with Mary, so has Harry Potter's author replaced God with Satanic powers. Deuteronomy 18:10-12: "There shall not be found among you any one that maketh his son or his daughter to pass through the fire, or that useth divination, or an observer of times, or an enchanter, or a witch, Or a charmer, or a consulter with familiar spirits, or a wizard, or a necromancer. For all that do these things are an abomination unto the LORD..."
1 Corinthians 10:19,20: "What say I then? that the idol is any thing, or that which is offered in sacrifice to idols is any thing? But I say, that the things which the Gentiles sacrifice, they sacrifice to devils, and not to God: and I would not that ye should have fellowship with devils." There are demons behind all of these!!! Because it takes people away from the living and true God, Jesus Christ. It plunges them into darkness and demonism (the real gods of the occult). There is reality in the world of demons. There are fallen angels and a spirit world around us. This stuff is real folks, and today people are fascinated with it. Ozzy Osbourne went straight to the top of the rating's chart in 2002. He is known for upside-down crosses and blasphemies against Christ. Thousands of teenagers died in the 1970's and 1980's due to suicides, murders and drug overdoses while idolizing Ozzy's works of darkness. People are intrigued with the occult. People use drugs and every other means they can think of to try to make contact with this unseen world (and the Satanic world is eager to make contact with them). A child of God must leave this mess alone! To dabble in astrology, witchcraft and other forms of Satanism is to turn away from the Holy Spirit and the Word of God. God has given us warnings concerning this. His warnings have been very accurate in the past. His batting average, friend, is excellent--He hasn’t missed yet. God hits a home run every time, and I am going to go along with Him. You would be wise to do the same.